The small amount of baking soda in these cookies gives them a little lift, but not so much that they lose their shape. Be sure not to overbake these cookies; they are delicious when they're a bit chewy. Shape dough into two disks. Cover and refrigerate for 2 hours. Preheat oven to 375 degrees. On a lightly floured surface, roll out dough 1/4 inch thick and cut with your favorite Ann Clark cookie cutters. Bake on an ungreased cookie sheet for 5 to 7 minutes or until bottoms are light brown. Remove from cookie sheets and cool on wire racks. 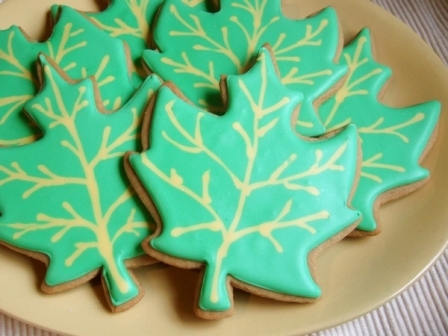 Cookies can be frosted with Maple Frosting, below, or eaten plain. Melt 1/4 cup (1/2 stick) unsalted butter and stir in 6 tablespoons maple syrup. Add 3 cups confectioners' sugar and beat until smooth. Add additional maple syrup 1 teaspoon at a time to make a frosting of spreading consistency.